Did you know that Texas is home to eight metropolitan transit systems, 39 rural transit systems, and 33 urban transit systems? Public transportation is critical to supporting our state’s and our nation’s larger transportation network and infrastructure. As our state continues to experience unprecedented growth, public transportation providers must keep up to support the flow of commerce and improve mobility. Comprehensive public transportation systems throughout our great state have transformed communities for the better, even for those who do not ride. 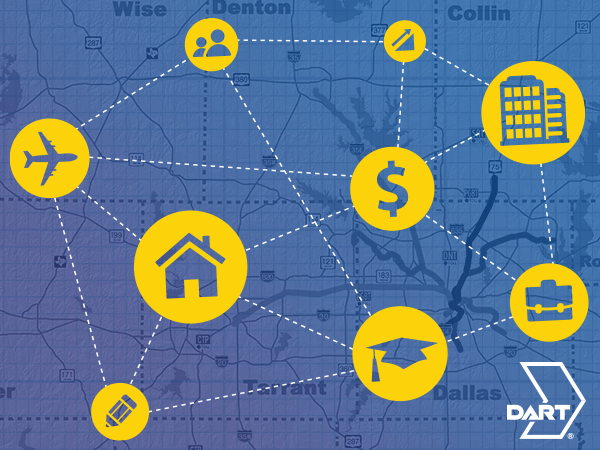 Texas is the third-fastest-growing state in the U.S. and leads the nation in economic development. Home to two of the nation’s top metro areas, Texas has more companies relocating here every year. Growing states like Texas must support alternative methods of mobility, like public transportation, in order to accommodate this population boom. Investing in public transit spurs economic development. In fact, for every $10 million invested in public transportation, there is a $30 million increase in business sales. Here in North Texas, public transportation is driving our local economy. 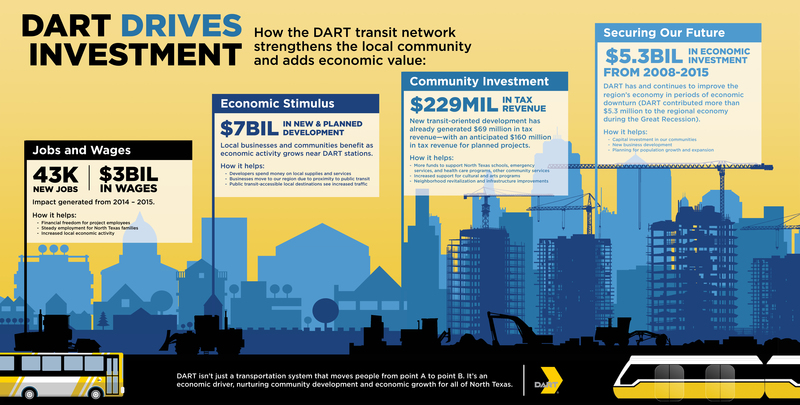 More than $7 billion has been invested in new and planned development projects near DART stations, and existing and future development near DART transit will result in $229 million in tax revenue. Public transportation can increase nearby real estate properties, known as “transit premium” properties. This type of Transit-Oriented Development (TOD) premium can range from a few-percentage-point increase to as much as 150 percent. FAST FACT: Completed or under construction transit-oriented development near DART stations has already generated $69 million in state and local tax revenue. The study also projects potential spending for planned or proposed developments could produce another $160 million in state and local tax revenue. Public transportation is essential in creating and sustaining employment. The supply chain of public transportation includes much more than just light rail or bus operations. Manufacturing, service, construction, finance, insurance, engineering, and retail are just some of the industries public transportation investment supports. One billion dollars of federal investment in public transportation supports or creates 47,500 jobs. FAST FACT: Here in North Texas, 43,000 new jobs were generated from transit-oriented development between 2014 and 2015. Public transportation does so much more than help people commute to and from work. Everyone reaps the benefits of public transportation, including businesses and non-riders alike. This critical piece of infrastructure supports growth on national, state, and local levels.